Paper Stock: Finest quality acid-free, pH neutral 100% rag Essex coated cover Hi White 100 lb. art print stock. Born and bred during the early years of the Cold War, the B-52 Stratofortress became the symbol of deterrence and the centerpiece in an array of weapons that enabled the United States to face the Soviet Union for forty years and to prevail without a nuclear exchange. Today it continues to serve into the 21st century as one of the most versatile platforms in the Air Force. 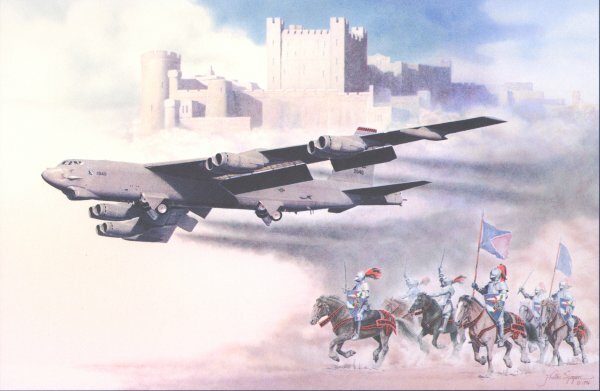 In the spirit of George Washington’s memorable quote, “To be prepared for war is one of the most effectual means of preserving peace,” this armored warhorse of the skies has, by its awesome capability, evidenced the determination and will of the United States to counter aggression and forge peace. In both nuclear and conventional roles, the B-52 has truly proven itself a mighty fortress in the sky. Artist Jody F. Sjogren links the past with the present in this visual “metaphor,” a symbol of the age-old clash of arms and noise of battle. Conjuring up images of Medieval times when kings ruled and knights defended the liberties of the kingdom, this B-25H and her crew of six on launch are warriors of a parallel world. How many symbols and parallels can you find in this message that spans the centuries? One observation is clear: over the course of human history, the nature of war remains the same … only the warhorses change.